Need answers on progressive plans for health care? This lawmaker's a good place to start. Rep. Pramila Jayapal is a co-chair of the Medicare For All Caucus and founder of a new PAC devoted to the issue. 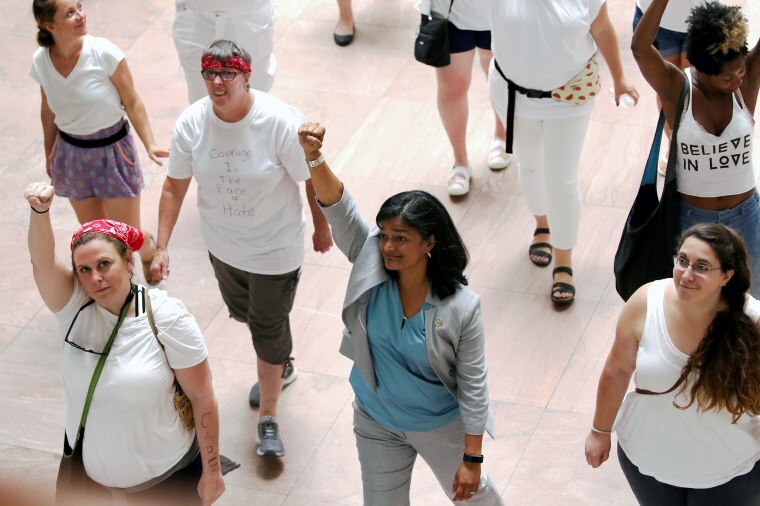 WASHINGTON — Single-payer health care is hot right now among Democrats, but Rep. Pramila Jayapal, D-Wash., got there early — first as an activist and then as a legislator. She's a co-chair of the Medicare For All Caucus, which has over 70 members. Now she's trying to give single-payer backers more electoral clout by founding the Medicare For All PAC, an organization devoted to backing like-minded candidates. The organization arrives at a critical time for single-payer advocates. While Medicare For All has made huge strides within the Democratic Party, there are internal debates about its viability and the issue is likely to play a big role in the 2020 presidential contest. Republicans are already attacking single-payer in midterm races around the country, providing an early test for supporters. Jayapal spoke with NBC News' Benjy Sarlin recently about her new PAC, the role she hopes to play in passing Medicare For All, and how she responds to its critics on the right. The conversation is below, edited for length and clarity. NBC NEWS: What do you hope to achieve by starting a PAC focused on this specific issue? JAYAPAL: Looking at the momentum around the country, we have this incredible opportunity where I think Medicare For All has become a mainstream idea, if you will. The Affordable Care Act was a big part of getting there, of getting Americans to believe health care is a right, not a privilege, but there are still a lot of problems with the system we have. It's my firm belief that until we have a system where the government funds health care for everyone and provides health care for everybody that we're not going to have that kind of quality affordable health care. Pramila Jayapal represents Washington's 7th Congressional District, located in Seattle. She is the first Indian-American woman elected to the House of Representatives.Courtesy of the Office of Pramila Jayapal. I formed the PAC to really help candidates that are on board with this idea, that want some more education, want some more support, and are ready to go out and talk about it in a real way with their constituents. NBC News: We're in a period where there's a debate over what Medicare For All means. Some people interpret it as single-payer health care, others talk about plans where everyone has an option to buy into a Medicare-like plan. How does your PAC define it and why is this distinction important? JAYAPAL: I think the closest bill we have, and I think we're still looking at it to see what changes we might want to make, is the Senate version of the Medicare For All bill, Bernie Sanders' bill. For me, it's not enough to just have a Medicare buy-in, I really think we need a transformation of the system so that we can take out a lot of the costs that are coming through both in the administration of our current health care system, but also in terms of things like pharmaceutical drug prices. We want to endorse people who are wholeheartedly in for a full transformation. I think people who say 'Medicare For All,' but in the next sentence say 'and we have to take 20 steps to get there,' that’s not likely to be where we’re going to put our money. This is a crisis and people are dying, and I don't think we have the time to just add a portion of the American public every year. NBC News: Could the PAC play a role in determining which presidential candidates are taking this issue seriously? JAYAPAL: It's absolutely our intention to be relevant in the 2020 presidential election. I believe that we're going to have a lot of support and that will give us some money that we can use to help those candidates that are running for president that are ready to embrace bold change and not incremental change. NBC News: This has mostly been a debate between Democrats until recently. But there's a new explosion of ads by Republicans attacking Medicare For All. Are you concerned about a conservative backlash? JAYAPAL: I honestly think Republicans are wrong about this. All the polling shows that this is an issue that does really well, not just in Democratic districts, but in Republican districts as well. When you look at Red to Blue candidates — we're talking about Democratic candidates in swing districts — 20 percent are endorsing Medicare For All. I think there's a real opportunity here and I think that anybody who is trying to run on a platform that is opposing a Medicare For All plan is actually going to be in trouble. NBC News: Most of the attacks are similar in substance. They say it will cost $32 trillion, that it will require new taxes, that if you like your employer plan, you’ll lose it. Do you get questions from your constituents about these issues? How do you respond? JAYAPAL: My constituents recognize and people across the country recognize that these are just fear-mongering tactics, that they're not real. The reality is that people are struggling under the burden of health costs now. They know the system doesn't work. They know they have pre-existing conditions covered through the Affordable Care Act that now Republicans are trying to strip away. But I do think there’s more work we have to do both within our own party and with the public in general to say okay, what does this really look like and how do we address some of the real concerns out there and how do we make sure we're talking about them in ways that help people to start to feel even more comfortable with it. Intuitively, I think the American people know this is the right thing to do, but they do want a little bit more of a road map to how we get there. NBC News: Some new Republican ads raise the issue of undocumented immigrants, saying they could be covered under a single-payer plan. The single-payer bills in the House and Senate leave this ambiguous. How do you think Democrats should manage the issue? JAYAPAL: I think we have to be clear in standing up for immigrants and fighting on behalf of immigrants across this country who are making the economy work, but we also can't be distracted. If they want to turn every issue into an issue about immigration, I think we have to point out that they're the ones stripping health care away from Americans in every single district across the country. They are the ones trying to make it impossible for people with pre-existing conditions to get their health care, they're trying to make it impossible for seniors to get their Medicaid paid for. NBC News: Do you think that a health care plan should cover undocumented immigrants? JAYAPAL: I think the health care plan should cover as many people as possible, every single American. When we were pushing for the Affordable Care Act, the idea that people who live in this country and who do work should be able to access health care I think was very important. What I would do is pass comprehensive immigration reform. Why do we have 11 million undocumented immigrants? The only reason is so that they can be scapegoats.